I’m still on Vancouver Island, and today it was time to visit the third small brewery to open in the Comox Valley in the past six months. 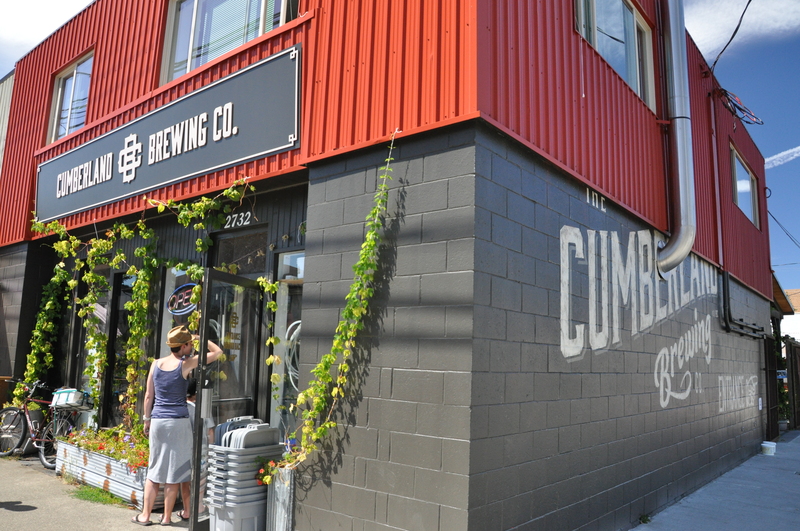 The first two, Cumberland Brewing and Gladstone Brewing, turned out to be very similar in size and in their approach to sales. 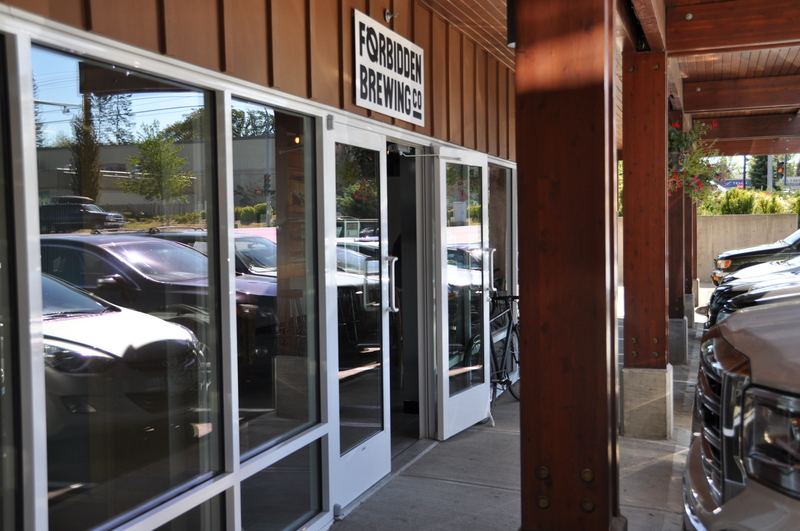 Forbidden Brewing, which just opened a few weeks ago, is different — that much was apparent as soon as I drove into the parking lot: While both Cumberland and Gladstone enjoy a relatively high visibility and profile, Forbidden is somewhat out of sight, in commercial space leased from a Best Western hotel in Courtenay. It’s too bad it doesn’t have a bit more visibility from the street, since it is on a well-travelled city artery in Courtenay, and within spitting distance of the 17th Street bridge, a major nexus for Island traffic. It’s obvious that Forbidden — or actually “Førbidden”, since they put a slash through the “o” to make it “Ø”, the international symbol for “forbidden” — has spent some time thinking about their marketing, going so far as to hire local graphic designer Ian Adams to create both their iconography as well as design a t-shirt for them. Similarly, some thought was put into the name: In an effort to establish a connection with the Valley, the name “Førbidden” echoes Forbidden Plateau, a nearby area so named because it was taboo to the local K’ómoks people who believed that evil spirits dwelt there. 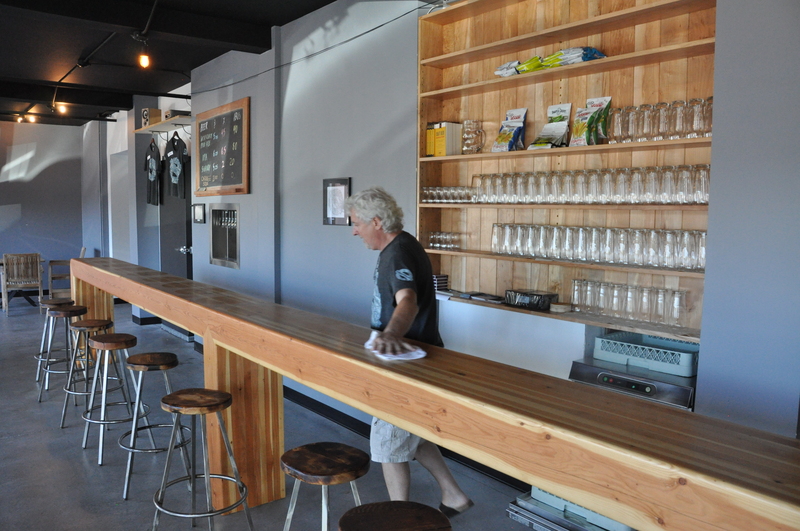 The tasting room, featuring a beautiful bar of local red cedar that contrasts with dove grey walls, is easily the most tasteful and stylishly modern of the three Valley breweries, again displaying a lot of forethought and planning. Michael Vincent, one of the co-founders of Førbidden, had just opened the bar as I arrived. Michael was the person who originally came up with the idea of the brewery when he had the opportunity to buy a used brewing system. 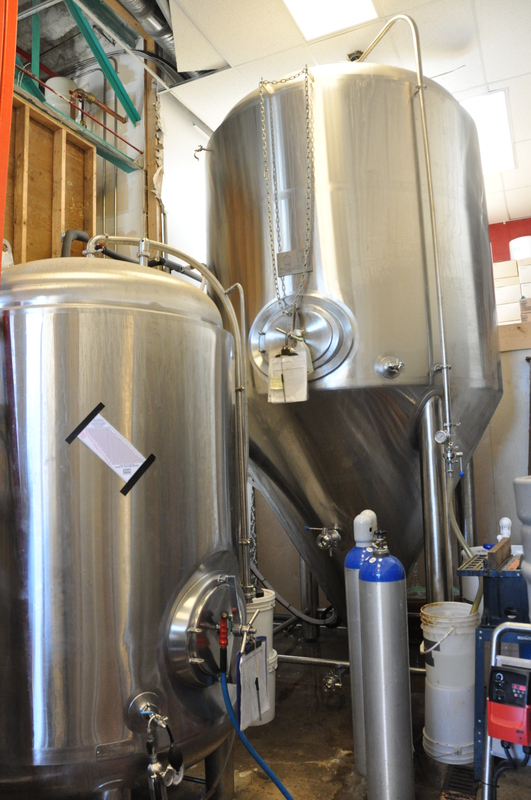 However, the equipment had to go into storage for several years until Michael found other people who shared his vision for a Valley brewery. That included Nicholas Williams, a homebrewer, who became the Førbidden brewmaster. Usually when you write a business plan to attract potential investors or apply for a bank loan, you outline possible obstacles to future growth, including potential competition. 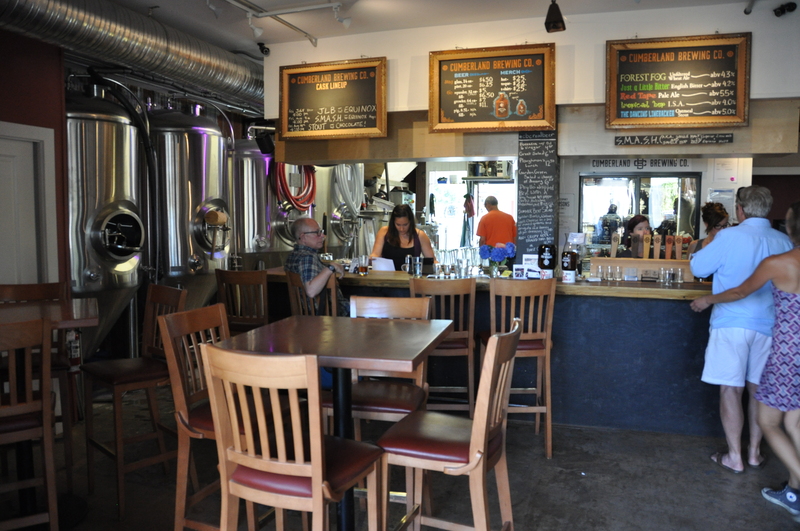 Given that there were no breweries in the Valley when the business plans of all three of these breweries were written, I’m sure each one of them touted the fact that there would be no competitors. It must have come as shock to all three when they each realized that there would not be just one but three breweries opening almost simultaneously. Michael was a bit busy when I dropped in — the regularly scheduled bartender had not shown up, leaving Michael to boot the point of sale system, ready the bar for the day’s business, pour beer and make change for the first customers of the day, while also trying to answer my questions at the same time. Luckily his assistant brewer, Nathan, was able to take me on a tour of the brewhouse while Michael held down the front of the house. 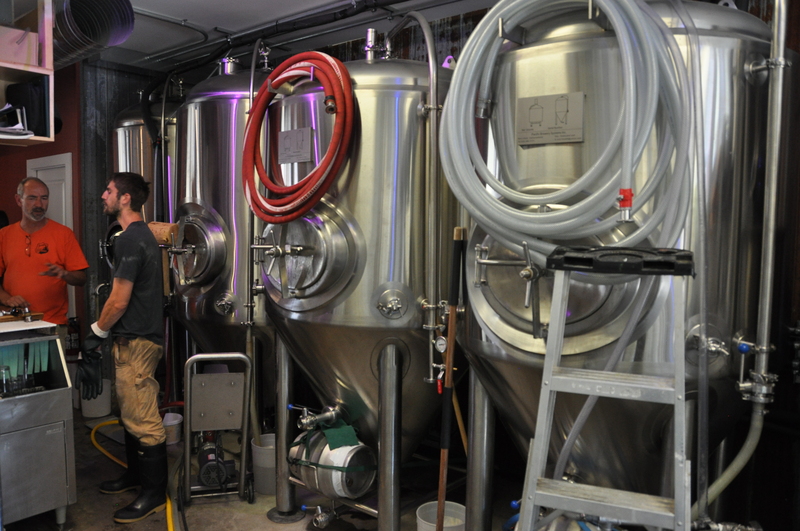 Of all the brewhouses I have visited — and they are legion — this was certainly the most unique set-up I have seen: six 50-litre vats lined up against the wall. It had a vaguely steam punk motif, reminding me of etchings of Victorian porter breweries with their Burton Union systems all hooked up in parallel. As Nathan explained it, although each of the six vats was only 50 litres, working together they formed a 300-litre brewhouse. To make a batch, each of the vats is filled with hot water, then a bag of malt is lowered into each vat. To mash out, the bags of grain are lifted out of the water. 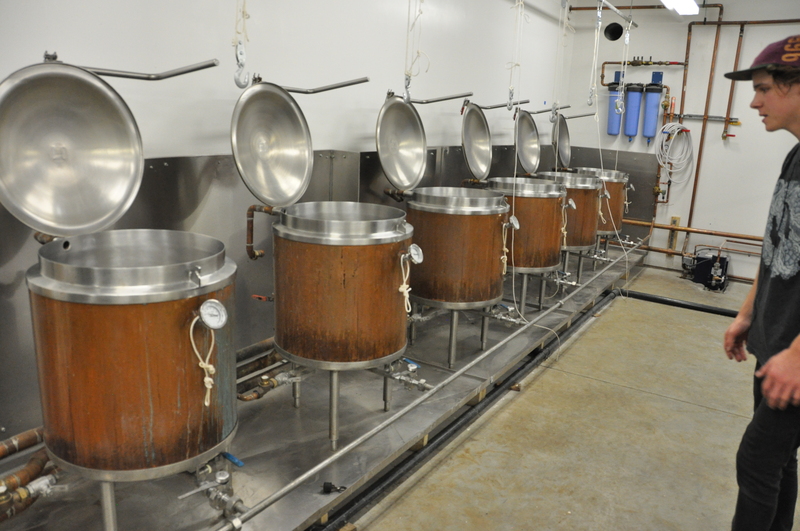 Each vat then becomes a small kettle, where the wort is boiled. At the end of the boil, the wort that is left — about 250 litres in total after evaporation losses — is transferred from the six vats to a fermentor. Each batch of 250 litres takes about six hours. Because their fermentor has a three-batch capacity, this brewing process is done three times over two days to fill the fermentor with about 750 litres. That is a lot of time and effort for a minimal amount of beer. To give that a bit of local perspective, Cumberland produces 1200 litres and Gladstone produces 1500 litres in about 4 to 6 hours — a lot more beer in about a third of the time. 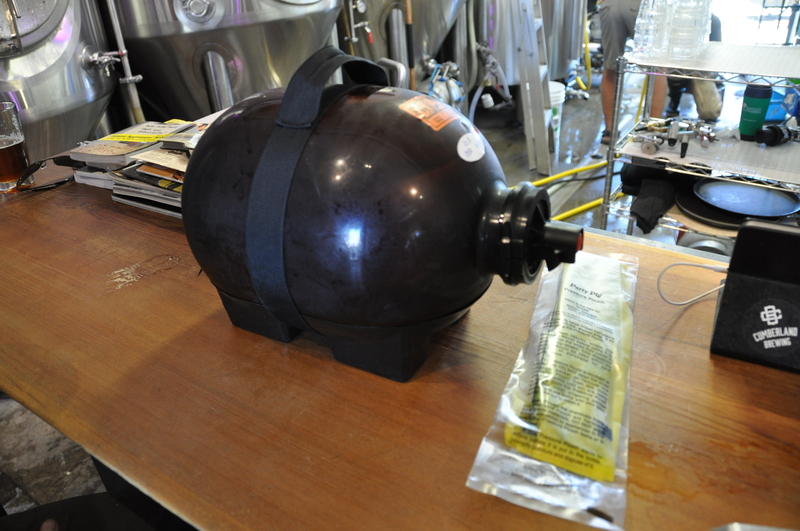 The fermentor turned out to be a large plastic cube. That again was a bit of a surprise — up until now, I have only seen homebrewers use plastic containers for fermenting. 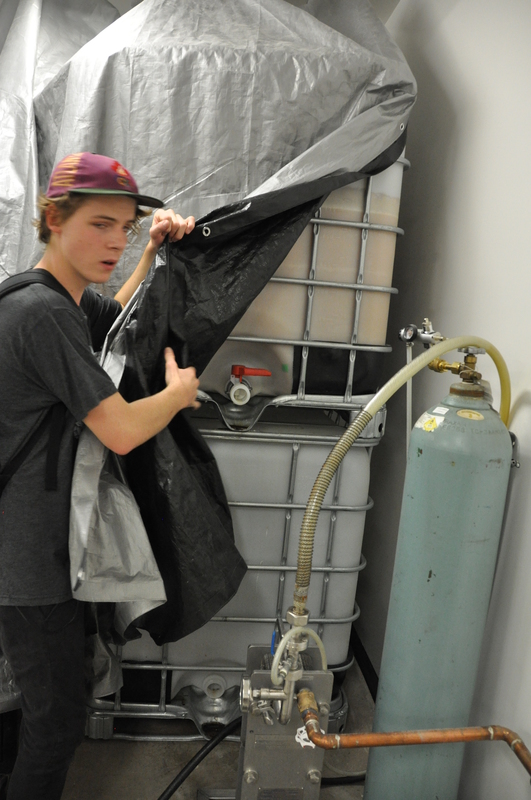 It’s not that there is a problem fermenting beer in plastic — for all intents and purposes it works just as well as stainless steel, does not cause off-flavours, and is impervious to both acid and caustic cleansers. But even a soft brush will cause microscopic scratches and abrasions during cleaning. Beer-spoiling bacteria can then hide in those abrasions, safe from caustic cleansers. And the number of these abrasions will increase with each cleaning. The good news is that the brewing room is actually quite spacious, and should Førbidden decide to upgrade their equipment — either by installing a professional 2-vessel brewhouse or by switching to stainless steel fermentors (or both) — there would seem to be plenty of room for the new equipment. Given the effort they have to put into each batch of beer, it’s not surprising that Førbidden makes only two types of beer — a west coast-style IPA, and a west coast-style pale ale. I had a glass of the pale ale, single-hopped with Cascade, and my gosh, despite the “homebrewer” look of the brewhouse, it was very good — aromatic, juicy and with a good bite at the end. At the moment, Førbidden only sells beer by the glass, and does not fill growlers. 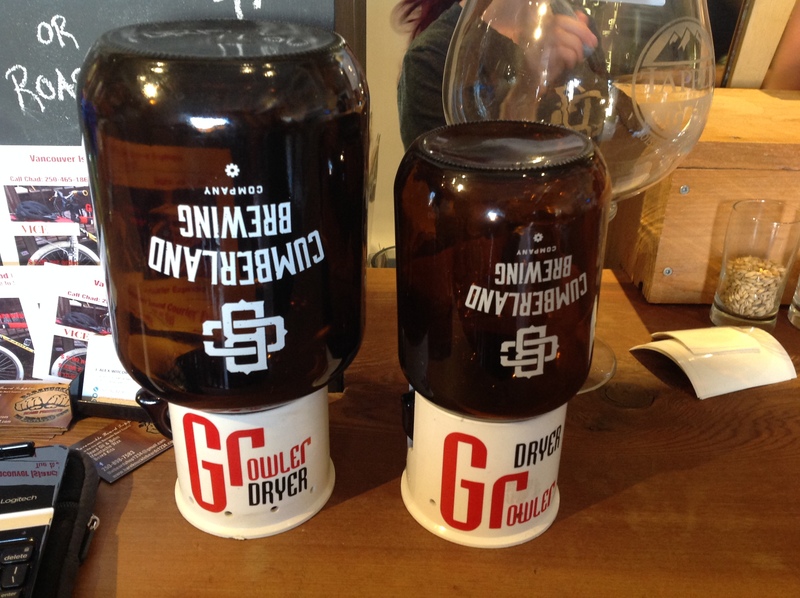 (Apparently growler fills will start in due course.) And in a step up from the other two Valley breweries, who offer pizza with their beer, Førbidden is able to offer a short menu of food that goes a step beyond pizza to nachos, fish tacos and burgers. 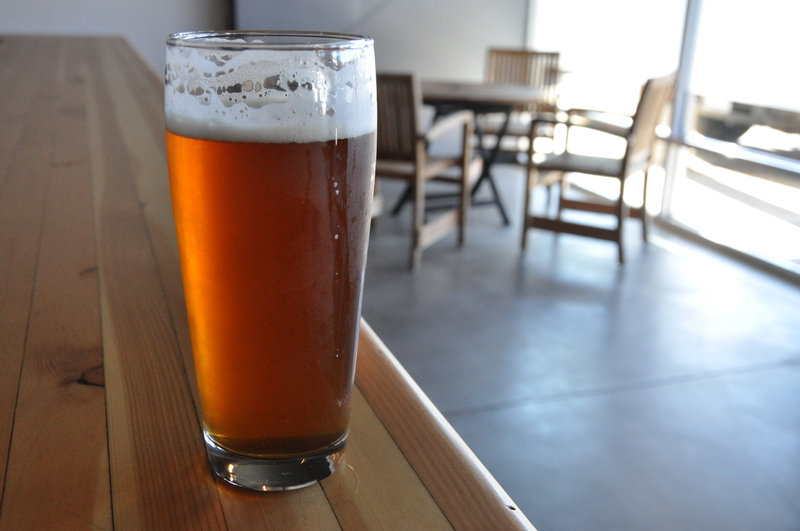 However, the tasting room at the moment is only open afternoons and evenings three days a week (Fridays thru Sundays). I haven’t seen or heard of Førbidden beer available at local bars or restaurants, and I forgot to ask Michael if they have any outside sales accounts. That, in a nutshell, is Førbidden, the smallest of the Valley’s three breweries. In terms of marketing and style, they are easily far ahead of the other two. The beer on tap is certainly of good quality. However, the amount of time and effort it is taking them to make a small amount of beer is troubling. 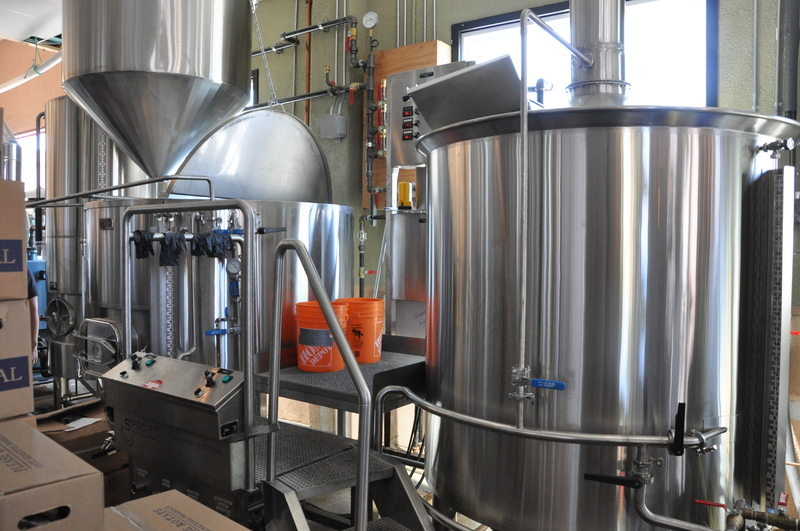 Can they make enough beer with their present equipment to turn a profit? Since they are open only three days a week, can they attract enough drinkers to their fairly low-key location to sell the beer they make? 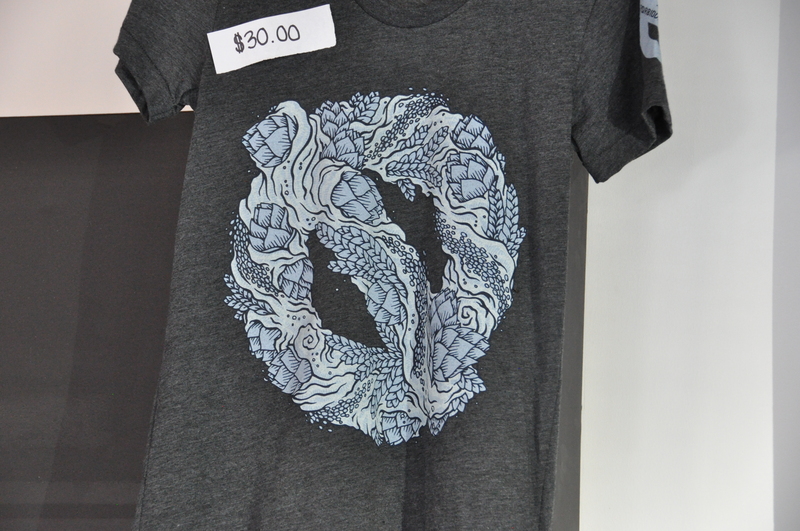 Tasty beer, great bar, I have the t-shirt — now I look forward to following their efforts over the next few months. 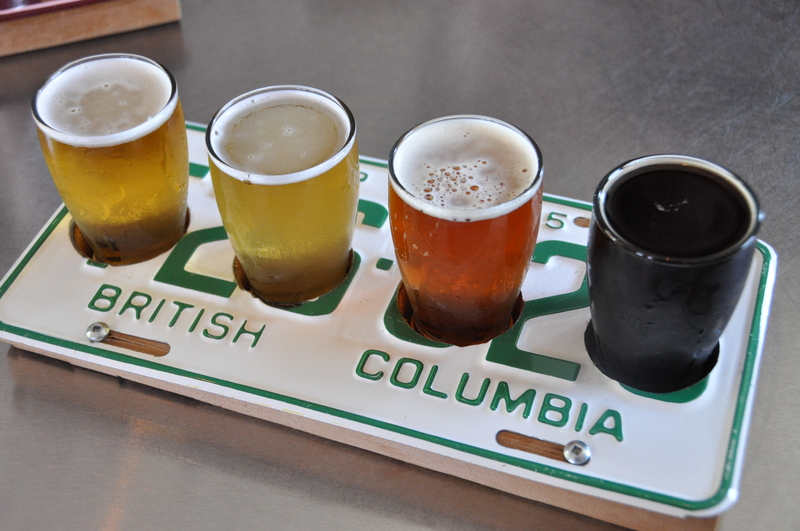 I’m still in the Comox Valley on Vancouver Island, checking out the three new breweries that opened in the past few months. 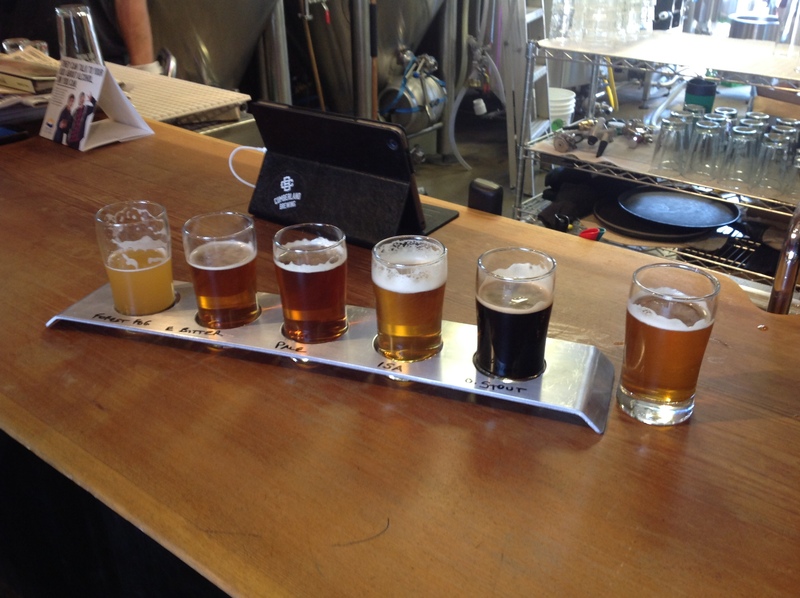 The second of these was Gladstone Brewing, located in Courtenay, a small city of 24,000. 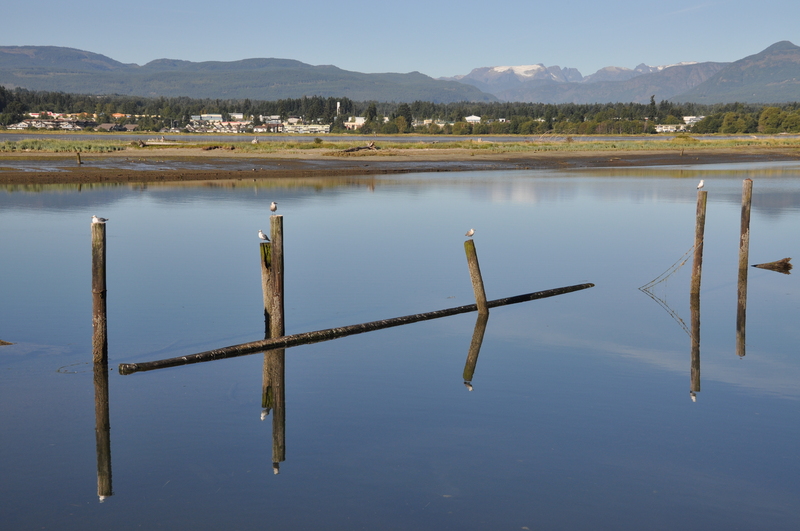 Courtenay is only a few kilometres from Cumberland but is a very different place — if Cumberland is a quiet town of outdoor enthusiasts and coffee shops, Courtenay is the bustling heart of the Valley, with modern malls, big box stores, transit buses and a lot of tourist traffic. It’s not all modern urban landscape, though. Several buildings in the downtown core date back to the 1930s, part of a major rebuild after a devastating fire. One of those buildings to rise from the ashes was an art deco-ish gas station and auto garage, which now houses Gladstone Brewing. Gladstone is the brain child of Daniel Sharratt and Alexandra Stephanson. 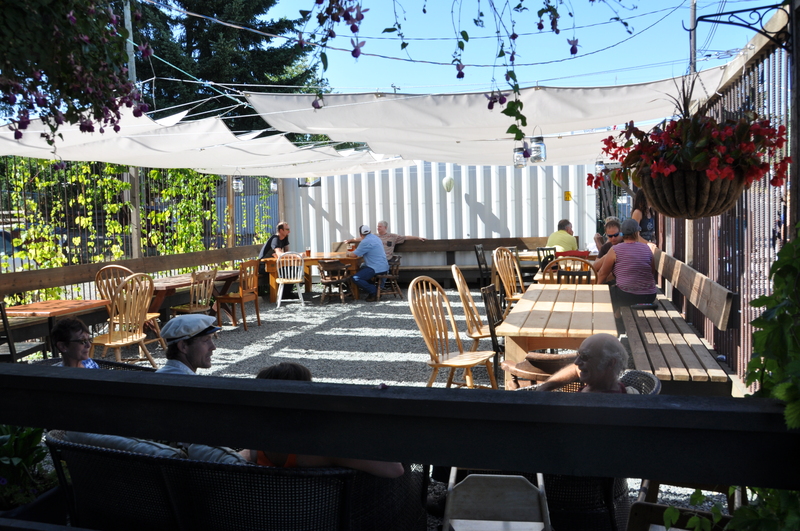 The name is a bit of an anomaly: although the brewery is clearly dedicated to connecting with the local community, there is nothing in Courtenay called “Gladstone” — the name actually refers to a street in far-away Victoria where Sharratt was living when he came up with the idea of opening a brewery. 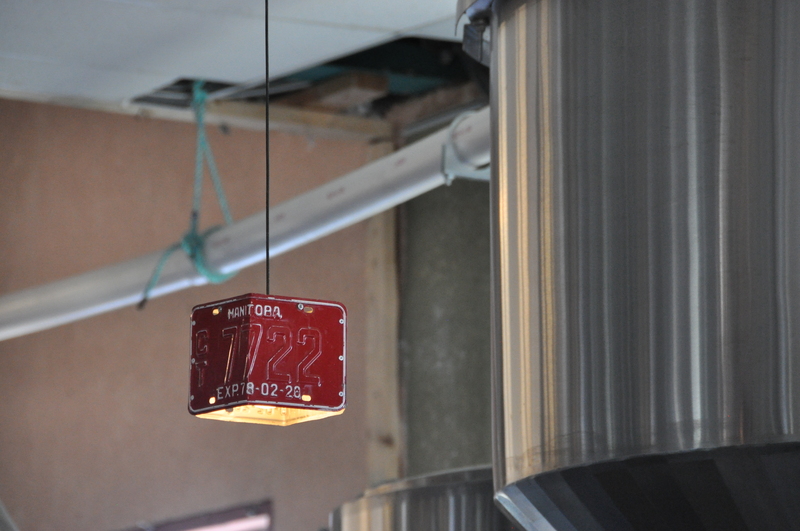 In keeping with the previous history of the building as a garage, the tasting room of the brewery has an auto mechanic theme from the 1940s, featuring hanging lamps fabricated from license plates, and old tools turned into tap handles. Shelves are filled with garage-themed artifacts, and a vintage 55-gallon oil drum sits by the tasting bar. I like breweries that completely take on a theme — Left Field in Toronto, for instance, has taken baseball and related everything to it: the name of the brewery, the names of the beers (I particularly like Maris* Pale Ale — you have to be a baseball history fan to understand the inclusion of the asterisk in the name), the fact that they chose the exact time of the first pitch of the opening day of the 2014 baseball season for their official launch. Even Left Field’s tap handles are shaped like baseball bats. Gladstone, on the other hand, has not totally immersed itself in the mechanic motif — although the tasting room has the look, the name of the brewery does not refer to the auto mechanic theme, most of the beers are unnamed, and those that have been named — Stirling Single and Evil Spirit, for example — don’t have anything to do with either the 1940s or a garage. It’s a head scratcher: the car mechanic theme has been well done inside the tasting bar, and has been utilised to some extent on their website, but that’s as far as it goes. Huh. I had arranged to speak with co-founder Daniel, but unfortunately the business of managing a brewery apparently intervened. However, I was able to chat with his wife and co-founder Alexandra Stephanson, as well as brewmaster John Adair. John, who used to brew at Vancouver’s Parallel 49, took me on a tour of Gladstone’s brewing facilities. The two-vessel brewhouse, like Cumberland’s, was made by Specific Mechanical of Victoria. This one has a 15-hL capacity, a fairly large size given that the mash/lauter tun has no power rakes — during mash-in, the grain has to be hand-stirred the old-fashioned way, by two people wielding mash rakes, and the spent grain is also cleaned out by hand following mash-out. Gladstone started with two 15-hL (single batch) fermentors, and like every other new BC brewery I have visited, discovered that their original plan for fermentation volume — only two batches’ worth, in this case — was woefully inadequate. Immediately after opening, they quickly ran out of beer, and having nothing to sell, they had to close the brewery bar for several days until the next batch was ready, a cycle that would be repeated several times. 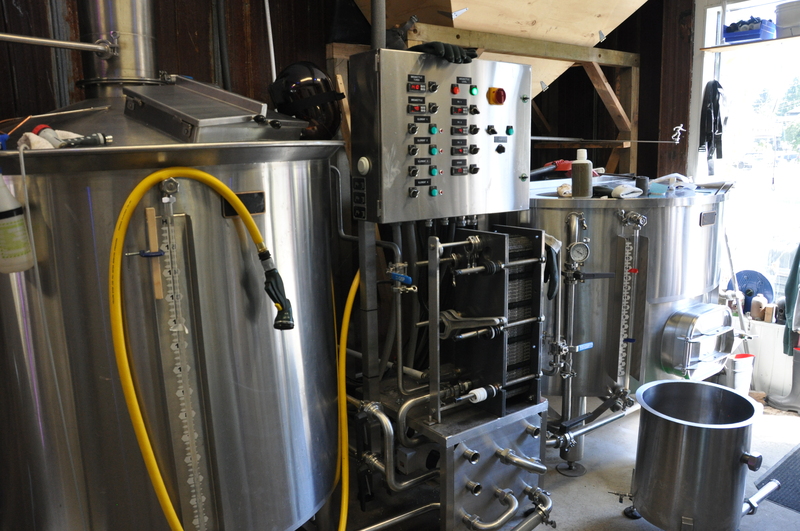 Gladstone immediately invested in another two 30-hL (double-batch) fermentors, and then installed in a 60 hL fermentor capable of holding a quad batch. It must have been a tight squeeze getting it in place — apparently there was quite literally only a half inch of free space on either side of the FV as it was being moved into the brewery. The end result is that within 6 months of opening, the brewery had quintupled its FV volume from 30 hL to 150 hL. Despite all this volume, they only keg enough beer to supply four local licensee accounts; otherwise, Gladstone sells the rest of their beer to walk-ins, either by the glass, or via growler re-fill. Are they planing to bottle or can their beer? John told me that the original business plan called for a packaging line to be in place by now, but at the moment, they have their hands very full selling all the beer they are making, so the added expense of packaging has been put off for the moment. They, like Cumberland, have also gone the pizza route in order to provide something of a brewpub ambiance. Where Cumberland is able to bring in pizza from the pizzeria right next door, Gladstone actually leases space inside the brewery to a pizza maker. Again like Cumberland, technically Gladstone is not a brewpub since they are not making or selling the food; but because people are able to eat (albeit from a fairly limited menu) at the same time as they can drink their beer, it at least feels like a brewpub. 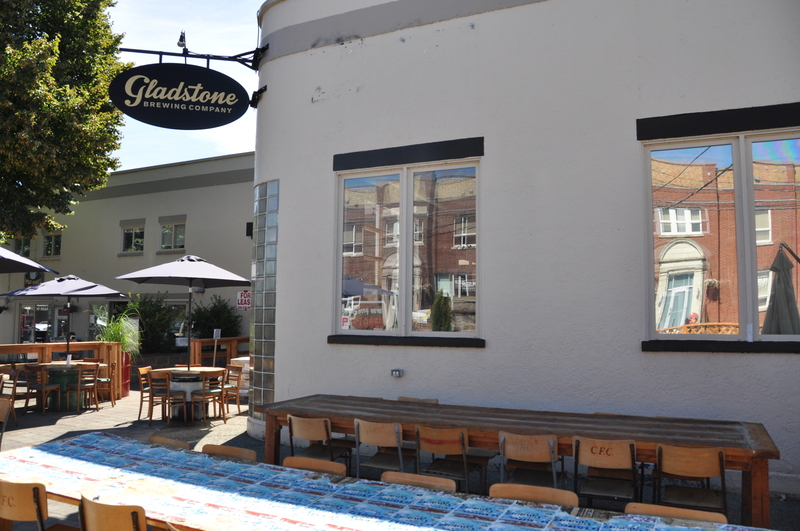 As for the new rule that allows craft breweries to cross-sell other BC craft beers as well as BC wines and ciders, Gladstone is considering putting cider on the menu. Much like Cumberland, they see offering an alternative alcoholic beverage as a way to draw more local couples to their bar. Although the wide mix of styles may seem a bit scattershot, all of them were competently made and tasty. 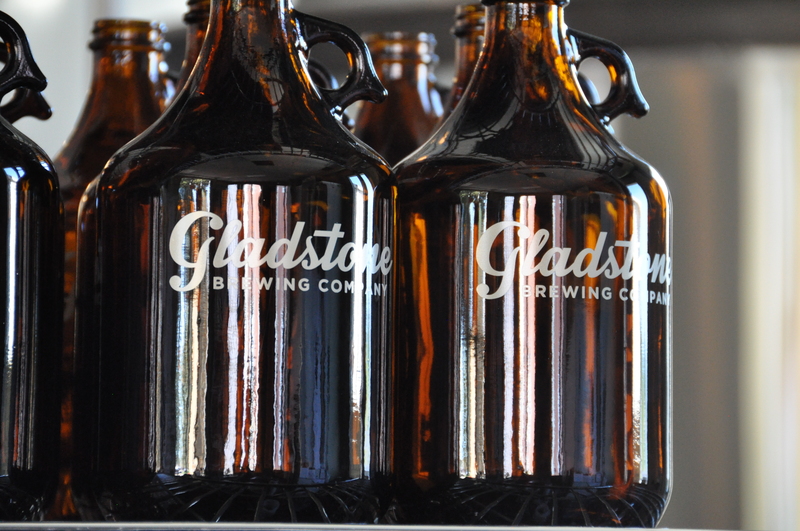 Despite geographical differences in their settings, Gladstone and Cumberland have remarkably similar stories — similar-sized breweries created in high visibility locations at almost the same time, with a business model focussed on a connection to the local community and sales by the glass and growler, with pizza on the side. Cumberland, however, seems to have their marketing mojo firmly on track. 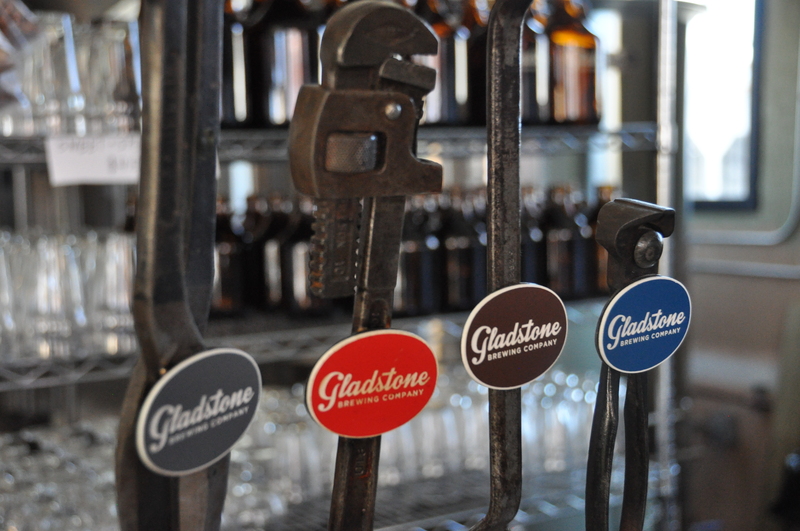 It will be interesting to see if Gladstone can move the clever use of their mechanic’s theme from the tasting bar into all aspects of their operation.